Our legal director Valerie Brown just spent some time sharing the wild with bears. 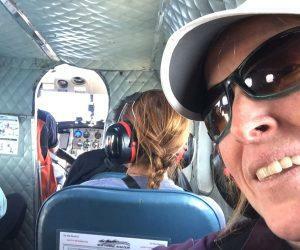 Here she talks about how the proposed Pebble mine could destroy one of her favorite places in Alaska. The proposed Pebble mine threatens McNeil River bears. I just returned from my fifth trip to McNeil River State Game Refuge and Sanctuary. It’s one of my favorite places in Alaska. It’s an exceptional place because our state officials decided a long time ago that you can not only let nature run wild, but you can also witness and feel the awe that only the wild gives us. People visit McNeil in a way that lets bears behave as they do in the wild, yet lets people view them. Visitors stay in designated areas and follow patterns that keep them from disturbing bears. Remarkably, the bears tolerate and ignore the people watching them fish, nurse, travel, and eat sedge. Bear eating sedge grass at McNeil. Photo by Valerie Brown. Instead of displacing wildlife, and then permanently altering habitat, our state chose to leave the natural cycle in full swing at McNeil. This vision has proven wise. 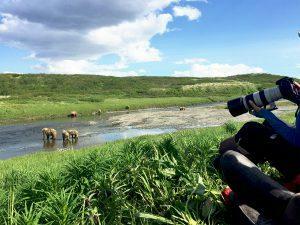 The chance to see these massive bears draws people from around the world, and adds to Alaska’s reputation as a place for the curious, the adventurous, and anyone who likes to travel. 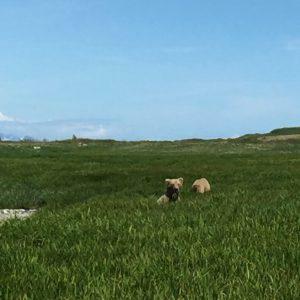 Each spring, volunteers and staff from the Alaska Department of Fish and Game prepare the sanctuary for the human visitors lucky enough to win the lottery for permits allowing them to see these bears. The permit system keeps the number of people in the area low, and minimizes impacts on wildlife. On the way to McNeil. Photo by Valerie Brown. This year I got a golden ticket for “Block A” and joined nine other people at a small camp, the only part of McNeil where people dominate the landscape. These few square yards contained our tents and a cook shack, where campers keep all food and eat their meals. It’s a comfortable set up, made more so by support from Friends of McNeil River, which supplies propane and cooking equipment to spare each set of campers from having to carry cooking fuel and bulky pots and pans. The lucky “Block A” bear watchers. Photo by Valerie Brown. Each morning, the McNeil Staff round up the lottery winners, and take them out into the sanctuary to view the largest concentration of brown bears in the world. The bears move based on where fish and other bears go. 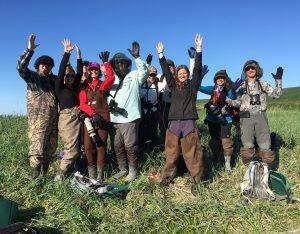 During my recent trip, we spent most of our time along Mikfik Creek, where the wild run of sockeye is just beginning to return to this part of lower Cook Inlet. The largest number of bears come later in the season when the salmon run is in full swing. We saw mostly young bears and sows with cub. It was cool to see these bears catch and eat some of the first fish of the season. Soon, a large run of chum salmon will enter McNeil River, and even bigger numbers of bears will congregate to fish at the falls. To understand what it’s like, you really have to go there, but Jeff Fair’s book, “In Wild Trust: Larry Aumiller’s Thirty Years Among McNeil River Brown Bears,” gives a detailed account of the decades of work that went into making the McNeil River area a safe experience for seeing brown bears. Watching bears for the first salmon of the season. Photo by Valerie Brown. Jeff and Larry are both worth spending time with, in whatever form you have access to, and I recommend this book highly. When writing this, I could see 11 bears, three sows with two cubs each, and two juvenile bears just learning to make their way. Alaska is a vast place where seeing bears in the wild can still happen, but only if we do as our leaders did to build the foundation for what McNeil is today. This mine threatens Bristol Bay’s economic foundation and the cultural traditions of the entire region. It also threatens the crown jewel of the State of Alaska’s special areas, McNeil River State Game Refuge and Sanctuary. 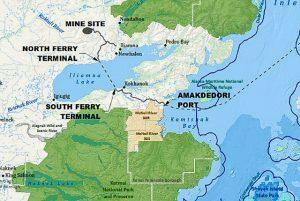 The Army Corp of Engineers is taking public comments on the Pebble mine project. You can comment here until June 29. After you comment, think about applying for your own golden ticket next summer. Applications are due by March 1, 2019.